Those days of a red-hot Devonport property market through 2014 to 2016 are now well behind us, as are the double-digit percentage price rises that were experienced back then. Today the Devonport property market is best described as steady. Such a market though offers benefits for both buyers and sellers, allowing more time for consideration and contemplation. The challenge for buyers today undoubtedly remains the level of available stock. At the end of March there were just 43 properties on the market down from 48 last month, these levels remain low compared to historical averages. For sellers the main issue is pricing. Median sales prices are still rising albeit at a slower rate, so the issue is all about setting a clear price expectation. In the past 3 months median sales price for all Devonport property edged up 4% to $1.58m, a rise of $68,000 over the past year. In terms of the number of sales, activity is relatively healthy with 53 properties sold in the first 3 months of 2018 up 6% year-on-year. In summary, if price expectations are realistic to this changed market situation then there are buyers out there looking to move. Looking at the specific market for house sales. The median price for all houses sold in the first 3 months of this year was $1.84m up $90,000 as compared to this time last year. In total 41 houses were sold in this period as compared to 35 for the same period last year a rise of 12%. This level of house sales for the first quarter of the year is pretty much in line with the long term average of the past 10 years at 40 sales. This indicates that the Devonport market is sustaining a stronger level of current activity than other parts of the Auckland region which for the first quarter of this year is down 18% compared to the long term average. The market for investment and owner-occupied units is however a very different story to house sales. 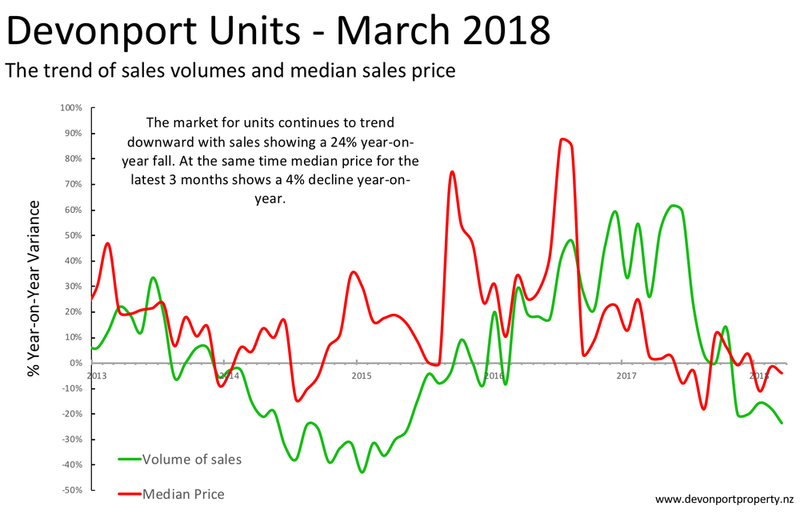 In the past year total sales of units have fallen from 34 sales in the 12 months to March 2017, to just 24 sales in the most recent 12 months; a fall of 24% year-on-year. The median sales price is currently fairly weak down 4% comparing the first 3 months of this year to the prior year at a level of $776,750.